I'm currently taking the Advanced Maya Dynamics - Breaking Ground class at CGWorkshops taught by David Alexander. The stuff we went through in the first week inspired me to write this little tool. It can fracture flat objects based on an image or by using voronoiTexture3D. 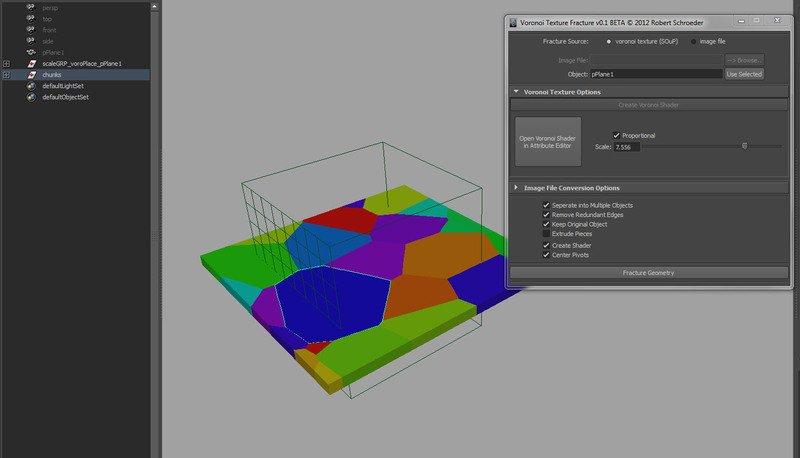 The voronoi texture can be created and adjusted through the GUI as well as the options for the texture to geometry conversion. You will need to have the SOuP plug-in by Peter Shipkov installed and loaded for this script to work. the "how to.txt" is not efficient, especially for soup beginners like me, please write a complete tut on how to install and use this tool. just give it a try and if you cant manage, just post in the soup forum & i'm sure someone else will take the time to help you out, just in case i'm busy. you are right, it is so simple to use, i should try before commenting you. just running the script is efficient. Hi Again it's very helpful thank you ! 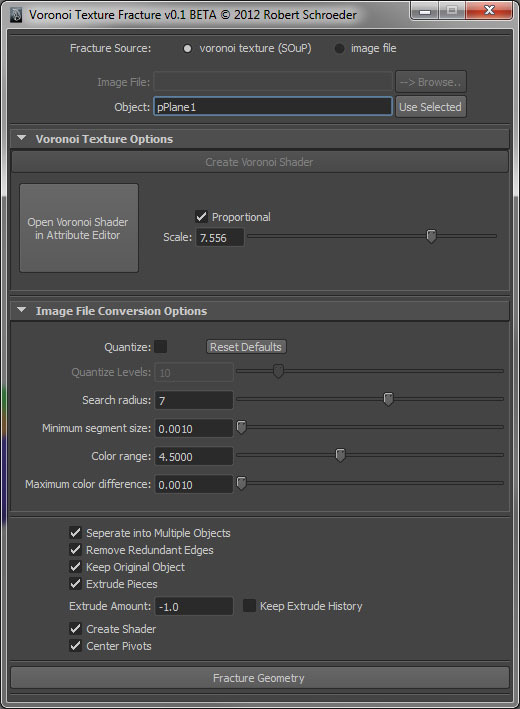 May I ask how you achieve auto convert image to shader in Maya. Does it has to do with soup? If you mean converting a shader to texture this is done with Maya's convertSolidTx. If you mean texture to geometry conversion this is done by Maya's performTextureToGeom (with setting some optionVars beforehand). Just have a look at the code and search for those two commands.